Thank you all so much for your suggestions and general good vibes that you sent my way! I haven’t had a chance to reply to them because all free time has become blankie-time. So, here’s a big public thank you to you all! Knit exclusively on the blankie. Any other knitting right now wouldn’t have the same meaning. I have 2 cute sweaters sketched out for the baby but they’re not being done in a day (one is a gansey and one is an aran). Look at the store to see if any of the coordinating items for the baby’s room are available. There are a few really cute ones that I could wrap up and be very happy with giving as a gift. Put together a gift for Kelly — bubble bath, candles, etc. She’s had to live with my brother’s baby inside her for almost 9 months. She can use a little pampering. I may also make a few bibs or burping cloths from MSD after finishing the blankie. I really like them a lot. I chose not to go this route for the shower only because it feels like cheating to hit the Saturday deadline. Two things that several of you said that made me decide this path were the fact that a) the baby isn’t born yet. Kelly is scheduled for a c-section on July 7th, and b) they’re my brother and SIL and will DEFINITELY understand. I will probably NOT bring the blankie with me to the shower. I want it to be a surprise in its completed form. Kelly used to read the blog but I had asked her to stop (and she’s so cool that I am positive that she did!) so I want the completed blankie to be the first time she sees it. She already knows I won’t be finished. My brother told her last night and she called me and told me it wasn’t a big deal. See, I told you…she’s very cool. Now if you got this far you deserve a pic of the blankie. Here it is, all 17 squares of it. The texture that has come out in the past day pleases me to no end. I’ve decided not to line it, which means every end has to be woven in as well as they can be (no hiding them inside the lining!). Those of you who know me well know that I take it as a good sign that I fell asleep last night knitting the 17th square*. And I’m using that to tell myself that weaving in the ends won’t be so bad either. I know, but let me live this lie for a little longer. * it’s a prime number! Your love of prime numbers always amuses me. A word of advice- start weaving the ends in each night. It makes it so much easier in the end. 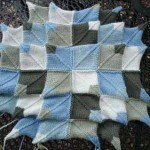 Last night, I finished square #42 out of 55* squares on the Rambling Rows blanket. At this point, there are no dangling ends! Good decision on the knitting and the shower gifts. *Neither of these is a prime number. hee. I am glad you decided to keep going on the blanket. Its really interesting, I am looking forward to seeing it all done. oh, how about weaving in the ends as you go? You know that technique where you weave the ends as you knit? I think you’ve got a good plan there. 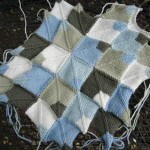 And I agree about NOT bringing the unfinished blanket–it wouldn’t have the same affect. Although, you could, say, braid the colors together and use it as a tie for one of the other gifts, so she could see what they look like…. I’ve actually thought about all your end weaving in and cringed for you. It’s a lovely blanket and a very lucky baby. You’ve chosen wisely. Even if your public must wait a while for progress on our sweater. The blanket looks GREAT and I’m glad you aren’t knitting anything else “in a pinch” (even though I was among those that suggested otherwise). That sounds like a wonderful plan. I had a scheduled C-section and one of the best presents I received was a big pile of frivolous magazines (People, US Weekly, Vogue, In Style – my brain was complete mush in the hospital and there was no way I could have read a book) and some nice lotion, lip balm and hand cream. It was wondeful being able to take those things with me and have some nice stuff to use at the hospital. You aren’t really supposed to take long baths when you are pregnant and it’s a complete no-no for a few weeks after a c-section, so I’d veto the bath bubbles. If you want to get something for the baby, find something practical on their registry or buy them a big box of diapers. People think those sorts of gifts lack imagination, but dude, diapers are expensive. 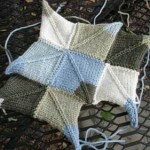 Your blanket will be the imaginative part. My advice is to sit down with your needle and an entertaining movie, and you’ll get the ends woven in. I did this with an intarsia blanket, and it worket out pretty well (I didn’t line it either). I think you made a wise decision. 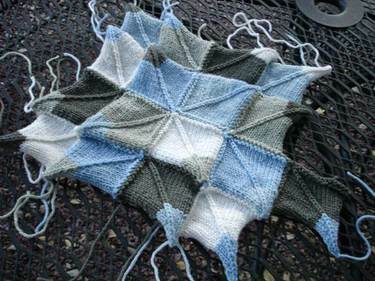 The blanket is going to be so cushy when it’s done. It will definitely be the baby’s favorite blankie!! What a beautiful blanket! The colors are just perfect. I love the suggestion about the diapers…if the child is breast fed the parents will be changing diapers so often they’ll never have enough of a supply! Did I miss a post about whether this blanket is your design or a pattern you are following? 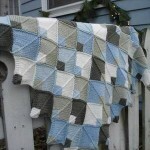 Is the pattern available…I would love to make one too! Your blog is very inspiring. Great pics and very nice work. Did you ever knit up that Drops Circle cardi? That is a beautiful project! Any handknitted item is a unique and wonderful gift, and as long as the baby can still use it don’t worry too much about the timing. Wow what wonderful colors! I am sure they are going to love it. This pattern is so beautiful. I will have to read back and see if you mention where you got the pattern. 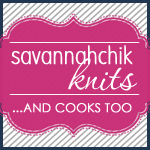 Keep knitting! Shower, scmhower. It will be a treasured heirloom, regardless of finish date.